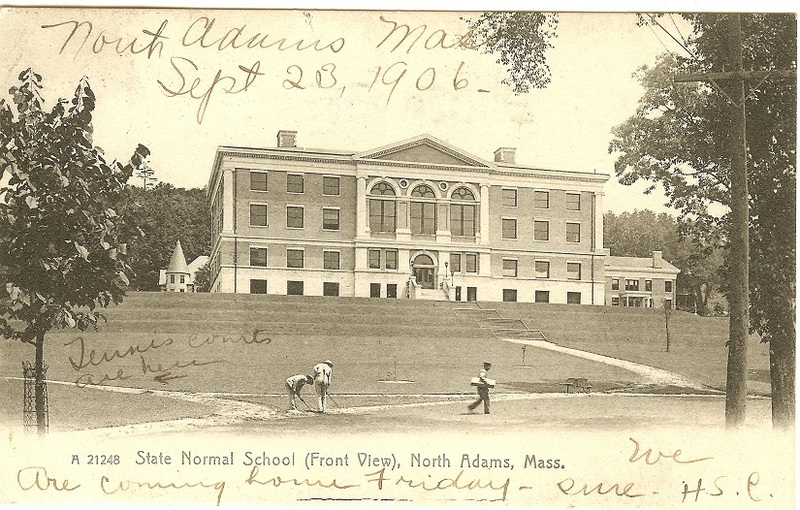 Massachusetts College of Liberal Arts was founded as the State Normal School at North Adams by an act of the Massachusetts legislature in 1894. Normal schools were created specifically to train future teachers for the growing population of children across the United States. The first students, twenty-nine women and three men*, arrived in February 1897. From 1903 until after the school became a teachers college in 1932, enrollment was exclusively female. Success in the two-year program did not result in a bachelor’s degree and graduates were expected to teach below the high school level, often in rural locations. High school teachers were required to have a bachelor’s degree. As more women entered the teaching profession, normal schools became four-year institutions and were called teachers colleges. Journal articles on normal schools can be found in our online databases ERIC (in EBSCOhost) and JSTOR.